* Can test the correct pin configuration of 10 Base T, 10 Base 2 Thin Ethernet cable, RJ11/45 modular cables 356A, TIA-568A/568B and Token Ring cables etc. * Easy to verify cable continuity, open, short and miswire. 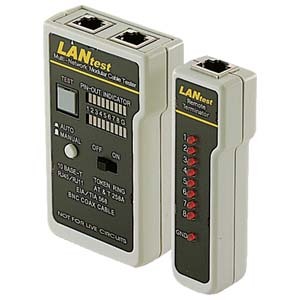 * With remote kit, it can remotely test cable up to 100 ft. away either on wall plate or patch panel. * Can test the grounding. * Feature with auto or manual scan for pin-out indicators. * A power switch is provided for saving battery power.